Our brick dust and infield conditioner improves drainage and reduces rain delays. It reduces compaction and helps prevent rain outs. 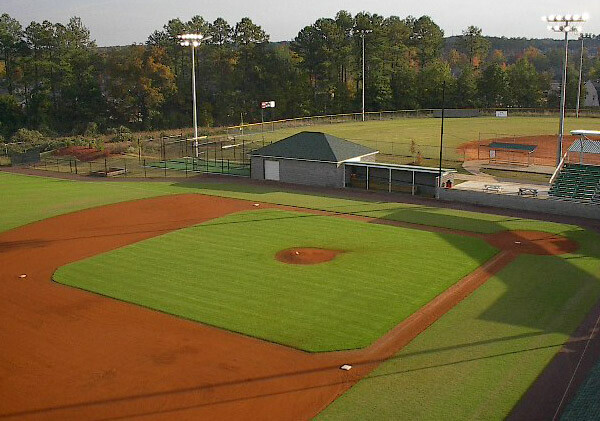 We offer infield conditioner in two products: vitrified clay and calcined clay. These products are an expanded shale and clay product that is fused together to make the resulting material resistant to water. This helps to improve field drainage. This also helps to prevent the material from compacting and compressing so it will not stick to cleats. Brick Dust Pro is excellent for fields. Our product, Pro Brick Dust, is dark deep red in color and it provides excellent drainage so that you can play ball immediately after a rain. We also carry mound mix. Infield Mix provides the baseball infield its beautiful red color, also known as "Georgia Red Infield Mix." Infield mix is also what you want to use to patch low spots in your field. If an area holds water you need to put infield mix in that area. You don't want to use field topping because it will quickly migrate out of a low spot that you put it in. The clay component of infield mix keeps it in place. We are one of the few suppliers in the southeast to carry this product. This premium baseball diamond mix screen size of 5/64" down to dust is extensively used by colleges, high schools, and park recreation departments. Our product is a beautiful dark red color. For a regulation baseball infield depth of 1" approximately 50 tons is needed. One ton covers approximately 96 sq. ft. at a 3" depth. Call us now for availability and pricing!